South Korea will always have a special place in my heart. I want to return there and live for two years after 2014 because I found Korean society to be so open and warm. Being there is something that’s truly amazing, because it’s like you’re a part of something that’s modernly historical while also being rapidly evolving. The moment I arrived in Incheon and crossed the Incheon Bridge into the city of New Songdo, I got the overwhelming feeling that Songdo (and South Korea) would be the future. It’s a country that’s in the making right before ones very own eyes. The pace of change is rapid and the technological innovations originating in South Korea are inspiring. I’m a rural American girl from a small town, and before going to Korea, I’d only ever read about globalization out of textbooks - well, now, I’ll gladly tell anyone that South Korea is the place to go to see globalization in the works. Whether you’re living in a Free Economic Zone or you’re simply going to Seoul to experience art and music in Insadong or the finest retail quality in either Gangnam or Myeongdong, you’ll be able to see globalization all around you. You’ll see it in the streets when you meet people from countries like China, Japan, France, Germany, Africa, Australia, Canada, or Russia. 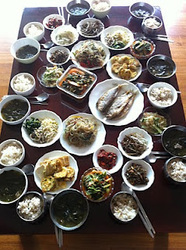 You’ll taste it in the foods, because it’s not only Korean. There’s Thai food, Vietnamese food, Japanese food, Italian food, American food, and such a variety of other foods that can be found in places like Itaewon or Sinchon. What I most love about Korea is that it embodies so much culture. Though South Korea is small, I never felt as if the society itself was largely homogeneous because it isn’t. To me, everyday was extraordinary because there was such variety, unpredictability, and so many unknown things for me to explore. 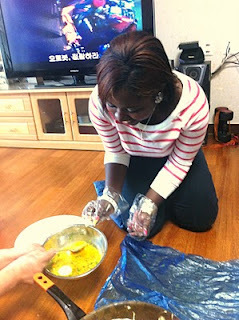 Being in South Korea was invaluable because it changed me. I’ve become more confident, but more importantly, I’m better able to relate to people who are not exactly Western. As an undergraduate Political Science major in my senior year of university, I understand and welcome the important role that Asia as a whole will play in the future. Living in South Korea and meeting citizens from Korea, China, Japan, Mongolia, India, the Philippines, Russia, and Africa - well, it allowed me to be able to personally relate to people who really don’t get much of an opportunity to voice their interests, their hopes, and fears beyond the stigmas surrounding their country. I learned that there is a lot still for us all to learn and share amongst one another. This is a true exchange program. It’s a wonderful opportunity that Lander students should take full advantage of because it is so unique among the study abroad programs that our university has to offer. South Korea challenged the strength of my character, while also enlightening me about the world and myself as an individual. I advise students to look more into study abroad programs in Asia and South Korea is a great country to start with. The Asia Summer Study Program is a once in a lifetime experience for any faculty member. For me, this trip expanded my world view in ways that I am still processing. 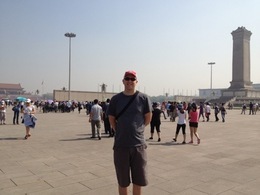 I learned more about Asian culture and history than I could ever imagine. I feel that it has begun a new chapter in my life and I look forward to more opportunities for connecting with students, universities, and communities in Asia. That being said, the focus of this report is to highlight some of the successes as well as areas of growth and improvement for next year’s program. First of all, Ms. Boyoung Roh did an outstanding job facilitating our pre-trip orientation sessions. These sessions helped familiarize us with the countries and cultures we would be visiting. Most importantly, it allowed us to get to know each other before we embarked on such a long journey. My only suggestion is that next year, these sessions should begin at the beginning of the spring semester, instead of being at the end of the semester, when everyone is tired (both faculty, staff, and students). I thought the make-up of students within the group was outstanding. Although understandably tired at times, I thought they did a great job of “putting on their game face” when they needed to. They were natural at connecting with local students and did a great job of connecting with their student buddies. I anticipate that they will be excellent recruiters for next years trip. Our hosts at each institution treated us so well. The accommodations were comfortable at each destination and the food was always generous and delicious. Although I think we did a good job of showing our hosts our appreciation, I encourage future group leaders to repeatedly emphasize the importance of this with student participants. I’d also like to highlight the excellent leadership of Boyoung. In addition to being a liaison with our host institutions, Boyoung brought positive energy and enthusiasm to each of our activities. In addition to exhibiting a strong sense of professionalism, she showed a natural ability to connect with each of our students. 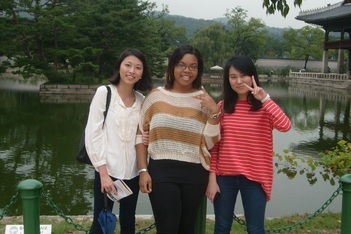 Three of our students were freshman and new to international travel. Boyoung showed great intuition and understanding in helping keep those students motivated and engaged in the trip. She also demonstrated professionalism and patience in dealing with one of our more needy participants. Her buoyant spirit never waivered and kept us all on track and focused throughout the trip. She was a pleasure to travel and work with. It seems to me that the central purpose of this trip is to strengthen our ties with our sister universities, as well as recruit students to Lander, while providing a powerful cultural experience for our students. Informal and formal recruitment opportunities were available throughout the trip. Each university provided “buddies” for each person in our delegation. For me, and many of the students, this was a highlight and allowed for a true cultural exchange and interaction. I believe our students’ friendliness and enthusiasm helped go a long way in recruiting interested future foreign students. Our group was eager to meet with local students and were natural at creating ties of friendship with students at our sister universities. These connections have continued through facebook and email and will continue when these international students decide to study at Lander. 1) Share up-to-date video about Lander - I think Boyoung’s video was the most powerful aspect of our presentation. 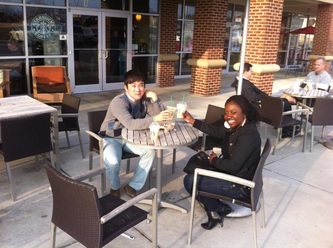 It shows international students at Lander having a dynamic experience (visiting places, eating with host families, performing at Lander’s Got Talent, etc.). It allows viewers to “see” themselves at Lander. I understand that University Relations & Publications is working on a new video about Lander. I’m not sure about the content of that video, but I think it would be great to show as well. a. Include caveats of exemplary Lander students who have gone on to graduate school and/or interesting jobs. The powerpoint show highlighted Lisa Brodhacker. I used that opportunity to talk about the large grant she’s received from NASA. I also talked about on of my honor students, Andrew La Croix, who just graduated from Lander with a degree in Chemistry. He worked with Dr. Brodhacker on her projects and was recently offered a full scholarship to Vanderbilt University to pursue his doctorate in chemistry. For a future presentation, I would include a picture of Andrew and more information about Dr. Brodhacker’s grant. I would also look for other personal examples of exemplary Lander students, particularly former international students who are now in graduate school or working. Perhaps that SACS interim report will have some up-to-date information to draw from with this report. 1) Carry plenty of business cards – I passed out more business cards on this trip than I have in my six years at Lander, and that still wasn’t enough. Bring a stack two inches think. 2) Bring your laptop – In order to pack lightly, I brought my iPad, which relies exclusively on wireless networks to connect to the internet. Wireless networks are either unavailable or extremely hard to join in Korea and China. When asked about connecting wirelessly, our host universities always seemed a bit puzzled. So, bring your laptop and prepare to connect manually through an Ethernet chord. 3) Pack light and encourage students to do the same – I packed pretty light, but not all of the students did. By the end of the trip, students had accumulated a lot of souvenirs and their bags multiplied. This made getting from one place to another difficult. We felt a bit bashful about the level of gifts we received from our sister universities in comparison with what we gave them. For example, the vice president of Shanghai Normal gave us a beautifully-adorned Chinese antique box. All we had to give him was a tie. I don’t think that represents our university in the best light. I know that increasing our gifts requires extra funding and that may be difficult in these times. Perhaps, the Office of International Programs could host a fundraiser? I am indebted to everyone who took part in organizing this fantastic trip. Thanks for allowing me to represent Lander in the capacity of faculty leader. I am confident that our trip was a success and that our Lander group represented our university and community in the highest respect. For any and all of the suggestions above, I offer my assistance and enthusiastic support. After being the recipient of such a wonderful experience, I feel a happy obligation to return the favor to future international students and visiting professors. 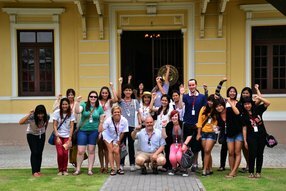 My time in Thailand with the Rajamangala University of Technology Phra Nakhon (RMUTP) English Camp 2012 was quite interesting. I hardly know where to begin; it was such an amazing experience. If you’ve never flown before, as was the case with me, just getting there will test you. Thailand truly has something to offer for everyone though. Personally, I really enjoy trying new foods, and Thailand certainly has much to offer in that area for the average American. Aside from food, of course there are many markets for shopping, karaoke lounges, temples, palaces, and a zoo… the list of things we saw and did could go on and on. Most importantly, though, traveling to Thailand introduces you to a way of life far different from what you’re accustomed to at home. Some differences are not only apparent in the classroom; they’re obvious within minutes of stepping outside and walking down the street. The streets are lined with vendors selling food or goods from their stands. Some Thai merchants without stands walk from car to car while traffic is stopped, offering snacks to drivers. Everyone does something and keeps a positive attitude while doing it. As you would expect from a culture that is predominantly Buddhist, they are very accepting of the way events unfold and release the futility of getting upset constantly. Thai people are just so at peace with themselves and life in general. It’s something everyone should see. Thais are also extremely friendly and love helping others when they can. I was lost briefly a couple of times, trying to locate obscure areas, but it never took more than a couple of minutes to find someone who knew enough basic English to tell me how to find my destination. In the classroom, Thai students are a lot of fun and really easy to work with. Even though we were almost as young as the students we were teaching, they show a great deal of respect for their teachers and never seem to have angry outbursts, though I think Thai people are just generally hard to upset. The small age difference made it very easy to relate and form friendships with members of my camp. The Thai students are also very cooperative, and work to make sure everyone understands what’s being taught before proceeding. The group dynamics were very different from what I’m used to seeing, but I liked it. Lecturing never became burdensome either as there were plenty of games to play in English that still helped the students improve their speaking ability. However, the time we spent with our students outside of the classroom was by far the best part. They were always enthusiastic and brought energy to the activities we engaged in. This applied to activities inside and outside of the classroom. We toured museums, visited a buffet where we cooked our own food, and shopped in numerous stores with our knowledgeable students acting as guides. It was a nice, mutualistic relationship. for their culture will make them love you. The program coordinators and supervisors also deserve credit for taking such good care of us during our trip. time each day. So, we were fed constantly (and in case I didn’t already mention it, the food here is incredible), given some spare money for extra food and small souvenir purchases, and given ample time to shop and spend our own money. on. I met so many people from completely different backgrounds than my own and formed lifelong friendships with some of my students. This camp was a great way for me to travel, make new friends, and try a ton of different things all at once while immersing myself in another culture. I’m really glad I signed on. This was a novel experience that has altered the way I view the world. As for my current progress here at RMUTP, it is going great! I have four classes, two of which I am a co-teacher. These courses include two "English for Hospitality," Junior and Senior classes, and two "English Conversation II" classes. I am having a great time on and off campus, as I am sure you have heard from Andrew. The students are very nice and fun to work with. The culture and country of Thailand is very beautiful. The Faculty has been very good in taking care of me. Professor Supatra has been more than gracious in providing us with a place to stay, helpful information, as well as a few tours of the city. I cannot thank you enough for helping me get over here! I am definitely having the time of my life. I have been told that "You need to find something you love doing, then find a way to get paid for it." I never knew teaching would be that "thing," but I have definitely succeeded in that aspect. 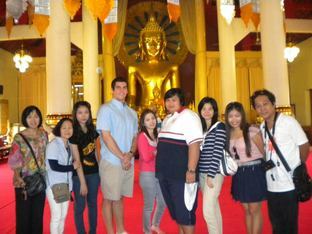 Along with Andrew, I will keep you updated with my progress in teaching, travel, and learning while here in Thailand. “Good afternoon everyone, we have just arrived in Incheon, South Korea, where the time is 3:24pm” I remember hearing the pilot telling us, moments before we landed at the Incheon Airport. I’m sitting in my seat in shock. I was really in South Korea and I was really going to be there for a whole semester. After arriving to the airport, I was looking around for someone who looked like they were looking for me. Then I saw this smiling face. He was waving really fast and smiling even harder. He came up to me and said “Hello, are you Nicole?” I replied “yes.” He told me his name was Leo and that he would be my buddy for the rest of my stay in South Korea, (but I didn’t expect that friendship to go pass Korea all the way to Lander University.) The first week in Korea was difficult; I started getting nervous of what other might think of me, or not being able to understand what someone is saying to me. But after the first week of school all the worried feelings I had went away. The University of Incheon has a program at their school just for foreign students. I made so many friends through this program and it really helped me get out of this bubble I was stuck in. In September 2011, the University of Incheon went on Thanksgiving break (Chuseok). I knew I didn’t have any family to spend Chuseok with so I planned on packing up on some noodles and staying in my dorms for the rest of the week.But my plans were soon to change. One of my Korean friends, Yun Joohee, invited me to spend Chuseok with her and her family. At first I was nervous. What if I did something wrong? What if I mess up a culture tradition? What if I can’t pick the food up with the chop sticks? When I got to Joohee’s house none of those worries mattered anymore, I was greeted at the door by her mother, father, brother, and grandmother. I helped her mother and grandmother cooked. Her family didn’t speak much English, but Joohee did a great job translating for me. Then Joohee’s mother said something that brought tears to my eyes. Joohee looked at me and said, “my mother said that she knows you don’t have family here but you can consider us your family away from home and you can consider her your mom away from home” Joohee’s mother saying this really filled my heart up with warmth. Here I am, completely different from them and they were so open and accepting of me. Another big part of me being in Korea was the school part. My professors were great! They were either Korean professors who were very fluent in English or they were American professors who taught in Korea. In most of my classes o was the only foreign student, so students would help me out a lot with school work and with finding s things around campus. I don’t know why but whenever I would talk to Korean students we always got on a discussion of music and we would have a big debate on who is better out of Rihanna and Beyoncé. After being in Korea for a month, I got to the point where I could travel by myself. I would go to Itaewon, and Hongdae and other Seoul areas. 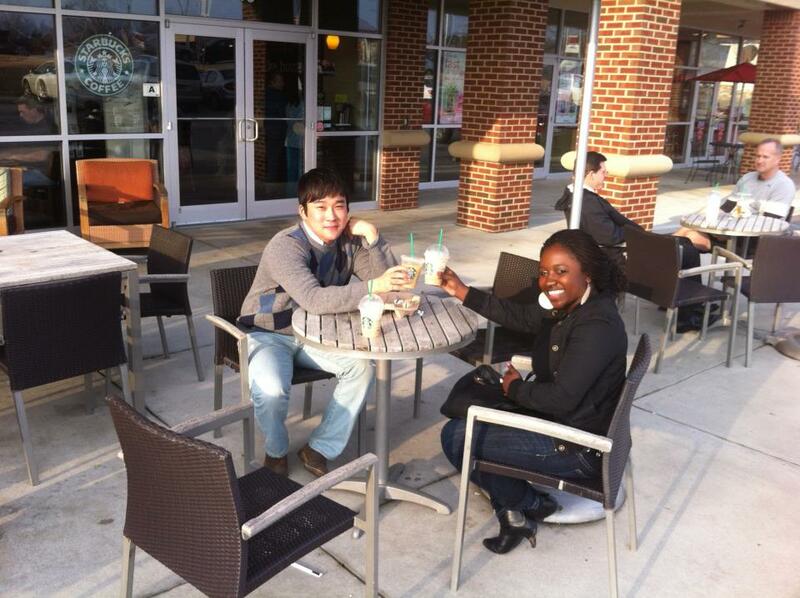 And since I was taking Korean language classes, I knew enough to get me around stores and restaurants. Something that I was not expecting while in Korea was finding work. There were so many Koreans who wanted to improve their English or they wanted their children to improve their English that they would offer me jobs to teach English to them. I think this was one of my favorite parts of being in Korea because I felt like I could finally give back to them since they helped me out so much. I started tutoring middle school girls every weekend, and I miss them so much. They always kept me laughing with their “middle school drama and their celebrity crushes” I was so shocked when they told me that they never tasted a “Pop Tart” before. When I heard this I wrote my mom and told her she had to send pop tarts to me so I could share the delicious taste of a pop tart to them. That one semester in South Korea went by so fast. When it came time for me to come home, I was very sad because there were so many people I was going to miss and there was so much of the country that I didn’t get to see.However, a couple of those friends are here with me at Lander University and I’m so excited that I get to show them around and help them out just as much as they helped me out. Going to South Korea really was a life changing experience. It opened my eyes to see things differently than how I use to see them.For a lot of the Korean students at the University of Incheon, I was the first African American they saw face to face and they were so fascinated with how much we had in common even though we were so different from each other. It’s like we no longer saw race and we saw personalities and feelings. I had one of my friends in Korea start talking in Korean to me and then when he realized what he was doing he started laughing and said “I’m sorry Nicole, I forgot you’re not Korean” I laughed with him because at that moment we were no longer paying attention to race or backgrounds, and we were looking pass all the outer appearance. I’m so glad I got this opportunity to go the University of Incheon, and I recommend it to everyone. You will learn so much about Korean culture and so much about yourself.